Port Elizabeth - Alex Goode and Thomas Waldrom will make their first starts for England in the third and final Test against South Africa after coach Stuart Lancaster named a side containing six changes on Thursday. Seeking a consolation victory after two defeats, injuries to flank and captain Chris Robshaw (thumb) and scrumhalf Ben Youngs (shoulder) has forced Lancaster to call up James Haskell and Danny Care respectively. However, wing David Strettle, lock Mouritz Botha, number eight Ben Morgan and loosehead prop Joe Marler drop out of Saturday's starting lineup to allow the coach a final chance to weigh up his options on the tour. Loosehead prop Alex Corbisiero and lock Tom Palmer will join Saracens fullback Goode and Leicester number eight Waldrom on the field, with Ben Foden shifting from fullback to the left wing. Marler and Botha are relegated to the bench while centre Brad Barritt, who suffered an eye injury in the first Test is also amongst the replacements. Care has not played for England since last August while Haskell, a member of New Zealand Super Rugby franchise Highlanders, will return to Test action for the first time since last year's World Cup. The 25-year-old Care has endured a turbulent start to 2012 and was dropped from the England squad in January after being charged with drunk driving. Going into the match having already lost the series, Lancaster maintained he was looking forward to what the new faces would bring to the team. 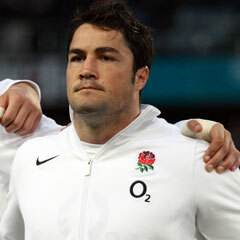 "I am really pleased for Alex (Goode). He has worked hard in training and has been pushing Mike Brown and Ben Foden close, so we are looking forward to him bringing his footballing skills to this Test," Lancaster said in a statement. "Danny Care, likewise, has bided his time in a very competitive position, knuckled down and deserves his chance, as has James Haskell, who has played this season for the Highlanders at number seven. "We felt that the pack got some momentum in the second half last week so we have gone for Alex and Tom, but I am sure Joe Marler and Mo Botha can make an impact from the bench."